PPHS senior Bailey Thomas (22) kicks the ball in front of teammate Lexi Watkins-Lovejoy (8), during the Lady Knights’ 6-0 victory on Monday in Point Pleasant, W.Va.
PPHS freshman Ellie Wood (28) plays a ball in the attack zone, during the Lady Knights’ 6-0 win on Monday in Point Pleasant, W.Va.
POINT PLEASANT, W.Va. — They say it’s tough to beat a team three times in the same season, but they forgot to tell the Lady Knights. 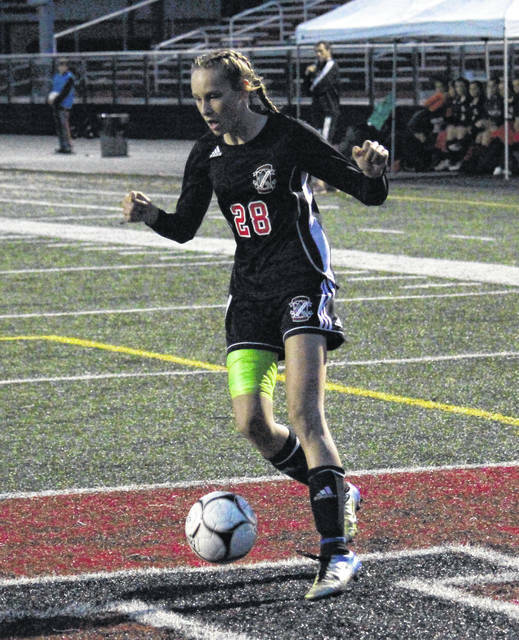 The Point Pleasant girls soccer team began play in the Class AA/A Region IV Section 1 tournament on Monday at Ohio Valley Bank Track and Field in Mason County, with the Lady Knights claiming a 6-0 victory over visiting Ravenswood for their third win over the Red Devilettes this fall. 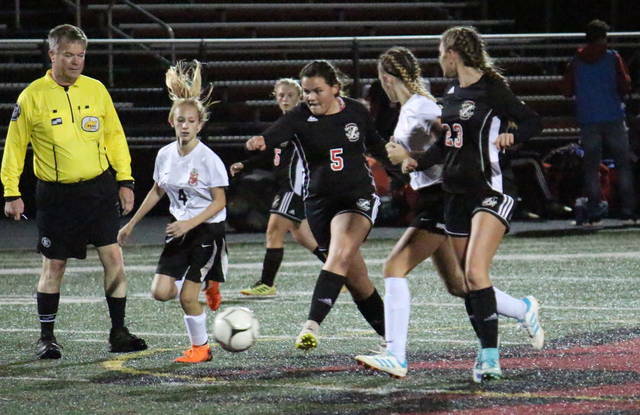 Point Pleasant (10-6-4) — winner of three out of its last four contests —broke the scoreless tie 3:25 into play, when junior Ashley Staats scored from 18 yards out on an assist from classmate Morgan Miller. Another 3:16 seconds ran off the clock before the Lady Knights increased their lead to 2-0, with freshman Kady Hughes scoring from close-range on an assist from senior Teagan Hay. 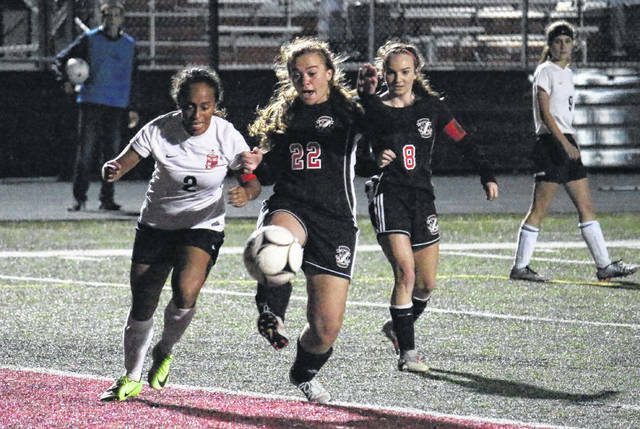 Point Pleasant needed only 2:25 to increase its lead to 3-0, as Miller found the back of the net from 12-yards away on an assist from senior Lexi Watkins-Lovejoy. The Lady Knights were held off the board for the remaining 30 minutes of the first half, but had all-16 shots on goal and all-5 corner kicks in the period. Freshman goal keeper Alyssa Smith picked up 11 saves in the net for the Red Devilettes (2-15-1) — who have now dropped five consecutive decisions. After the break, Point Pleasant needed just 6:29 to make its lead 4-0, as Hay found the bottom right corner of the goal from six yards out, with PPHS sophomore Katey Woomer earning the assist. Hay and Woomer flipped roles exactly four minutes later, as the sophomore scored a close-range goal on an assist from her senior teammate with 29:31 to play. 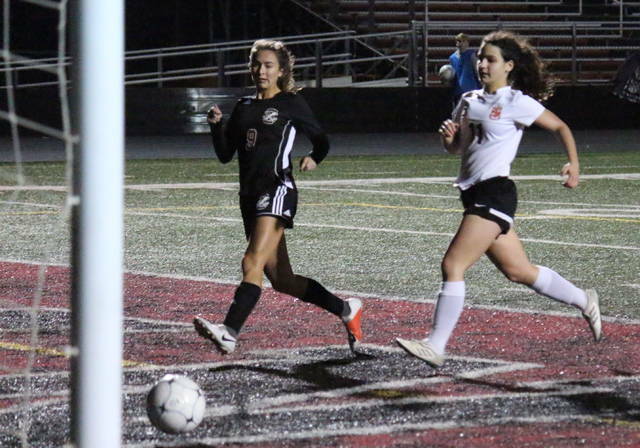 PPHS dialed long-distance for its final goal of the game, as Staats found the back of the net from over 20 yards out, on an assist from freshman Alivia Ahlers with 25 minutes to play. Point Pleasant had five shots on goal after the break, as well as three of the second half’s four corner kicks. Ravenswood got its only shot on goal late in the game, with PPHS junior goal keeper Monica Cook coming up with the save. For the guests, Smith added two more saves in the second half, giving her a baker’s dozen for the match. The Lady Knight offense was led by Staats with two goals, the longest two of the night. Hay finished with one goal and two assists in the victory, while. Miller and Woomer both contributed a goal and an assist to the winning cause. Hughes chipped in with a goal, and Watkins-Lovejoy added an assist for the victors. Point Pleasant’s regular season wins over Ravenswood included an 8-0 triumph on Sept. 18 in Jackson County and an 8-1 victory on Oct. 2 at OVB Track and Field. Following the victory, sixth-year PPHS head coach Chris Errett was happy with the postseason mentality his team possessed from the opening kick. Errett was hopefully that the Lady Knights could take the momentum from Monday’s win into their matchup with Williamstown on Tuesday. Point Pleasant is slated to meet the Lady YellowJackets at 7:30 in Dunbar. WHS has a pair of victories over the Lady Knights in the regular season, winning 1-0 on Aug. 23 in Wood County, and 2-0 on Oct. 6 in Mason County. Williamstown hasn’t been defeated in over a month, winning eight of its last 10 matches, with the others being draws. WHS is also the only team to defeat Point Pleasant on its home turf this month.